April is talking to her sister Robyn on the phone. April is worried about starting a relationship with a man who helped her out of a jam, and Robyn is trying to figure out why her sister has been so mysterious about her life the past few years. Before any resolution is reached, Robyn has to hang up to attend to her baby. As April puts the receiver down, Master Splinter walks into the kitchen. O’Neil explains her dilemma to the wise old rat. This was not the comforting solution that April was hoping to hear. Casey wakes up and quickly remembers what happened the night before. He hurries to the bathroom and retches. April walks by and calls out to see if he needs help and Casey orders her away. The bemused O’Neil dejectly walks off. Casey gets dressed and has an awkward silent moment with April in the kitchen before he takes off running into the woods. As he burns off his energy, Jones laments all of the “if only” scenarios that would have kept him from killing the young thug in the playground. Eventually Casey comes to a waterfall that has a fallen tree spanning the ravine, creating a bridge to the other side of the river. Donatello is sitting on the tree observing the stream in attempt to “understand the fractal structure of natural patterns,” an element of Chaos Theory that Donny is excited about. Don’s explanation irritates Jones and he blasts the Turtle for using big words and acting better than everybody else. Casey than demands to know why Donatello hasn’t spent any time with him. This reply only angers Jones more and Don asks him if they can take up this conversation at a later time, when Casey is sober. Jones pushes the issue and gets more and more agitated and threatening until Donatello is forced to draw his bo and teach Casey a lesson in manners and humility. In short order, Donny sends Casey careening into the water waiting below. Perhaps Jones also learned a thing or two about fractals while he was in the drink. Meanwhile, Raph, Leo and Mike are training in the barn while the news plays on a radio in the background. Leo beats Raph in two out of three falls when a report comes on regarding gang-related slayings in New York City between warring Asian factions. 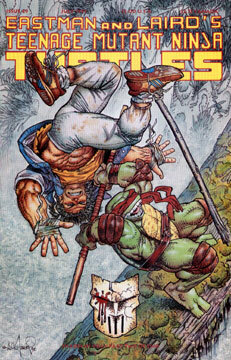 Upon hearing this story, Raph walks out of the practice session. Later, Casey is back at the playground where he accidentally killed the teen. The man called Nobody shows up, only this time he’s wearing his police uniform rather than his super-hero costume. Nobody tells Jones that the three other hoods turned themselves in and their story matched Casey’s, thus making it apparent that Jones was acting in self defense. “You sound disappointed.” Jones remarks. Nobody then relates his philosophy to Casey about the state of the world, a Yin-Yang theory that revolves around the idea that the further man advances, the more he regresses. The policeman then wonders how much longer the fabric of society can be stretched before it tears. Casey states that he doesn’t know, and Nobody then says that when he first met the TMNT he felt that they were an omen. “I thought that it might be a sign… a sign that the end was near… you know, ‘The Beasts Rising Up’, that sort of thing.” the cop states. “I won’t stop you.” replies Nobody. Casey then heads off in silence towards downtown Springfield.